Team-specific schedules and lineup sheets are zipped for convenience. 1. Practices are scheduled online. We do not use paper forms anymore. PLL will determine if your league allows managers to schedule practices online. Send policy questions to your GM. 2. To schedule practices online, you need to be a manager and you must be logged in. Your GM will set you up in our system as a "manager". If you believe you are not set up propertly, contact your GM. Login with the same username (email address) and password you used to register your child. To avoid problems, make sure your account has a different username (email address) than your spouse. If you need help with this, contact . As a manager, you can also do other things like send emails to your team from your team's roster page, etc. 3. 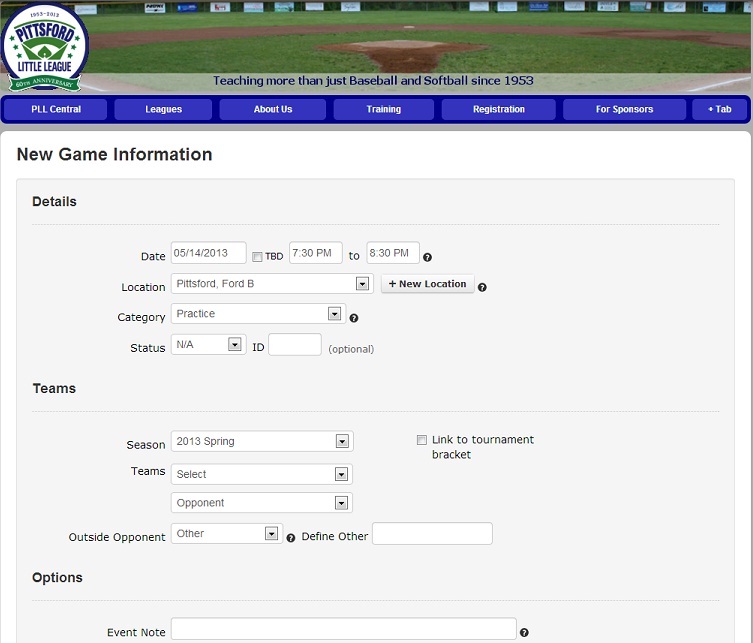 The easiest way to schedule a practice is to go to your team's "Schedule" page (off the "Leagues" menu) and click on the "Options" button (top right of content area) and select "+ Add new event". See screenshots below. Select your date and time. Select the field you want from the Location dropdown. If you do not know a field yet, you can select "TBD". 4. If you schedule a practice on a field/facility that we do not control -- we control Ford, Habecker, and GEP -- be aware that there is no guarantee that you will actually get the field. Thornell Farm Park is an example of a facility that we do not control. 5. Do not schedule a field more than 2 weeks out, to help prevent the hoarding of fields and times without giving everyone a fair shot. We will delete practices or modify them to "TBD" (see next item) if we catch you violating this courtesy rule. 6. You can schedule a practice at the field called "TBD" if you just want a placeholder on your team's schedule page, and later change it to a real field. 7. Evening daylight rapidly disappears in September and October. We may ask you to change your practice time if you are straddling remaining sunlight, like 5:30 to 6:30 in September instead of 5-6 or 6-7. 8. Games take precedence, so if you schedule a practice at a location and time that is needed for a game, your practice will be superseded. Fall Ball games are mostly on Saturday, rain date Sunday. Schedule practices accordingly. 9. Some fields are for use only by certain leagues. Habecker D, for example, for softball. GEP (Great Embankment) for Juniors. Please ask your GM if you are unsure. If you have questions about policy, email your GM or . If you have technical problems with the web site, email . Electronic scoreboards at Ford A, and Habecker C, D use wireless remote controls that are available at the snackbars. Download the instructions HERE. Do not let let the controllers get wet, but please use them! Return them to the snackbar at the end of your game. A 2-page summary from the LL handbook pertaining to safety issues. First aid manual for baseball. How do I login to the site as a manager/coach? To login to the site as a manager/coach, use your regular parent username (email address) and password. The system will know you are a manager/coach, based on the fact that you have been assigned as such in the system. If you don't know where to find the login form... There is a form in the upper right of the site. What if I don't know my password or want it changed? There is a "forgot password" link on the form. Can I use the website to send an email to my team? Yes. You must be logged in (see above). 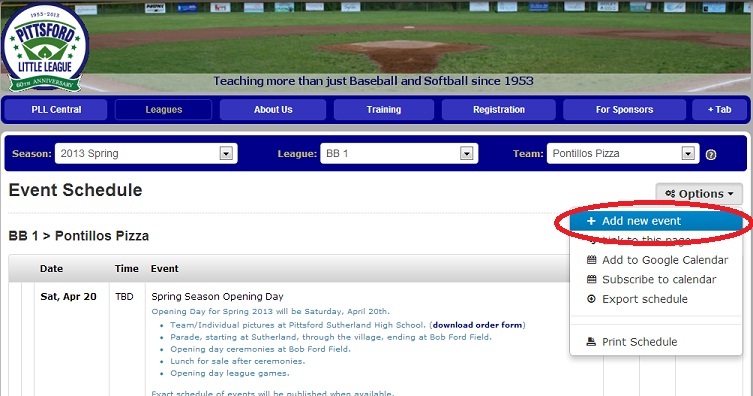 Go to your team's Roster page and there will be an "Send Email" link in the "Options" dropdown (upper right of the content area), which will open a form to send an email to your team. Alternatively, on your team's main page, you can post a message there and choose to also "Broadcast" the message to your team, which will send an email in addition to posting the message on your team page. How do I post game results? Currently, only GMs post game results. Posting game results makes them publicly available and will update the league standings. You must be logged in. To post game results, go to your team's Results page. Select your team, click the edit icon to the right of the game in question, and enter the results. How do I add player statistics including pitch counts? Currently, only GMs add player statistics. You must be logged in. To enter player statistics, go to your team's Results page. Select your team, click the statistics icon (Greek letter) to the right of the game in question, and enter the stats. Can I view contact information for my team's parents and players? Yes. You must be logged in. To view contact information, go to your team's Roster page. Click on a player/parent to view their contact information. How do I schedule a practice? 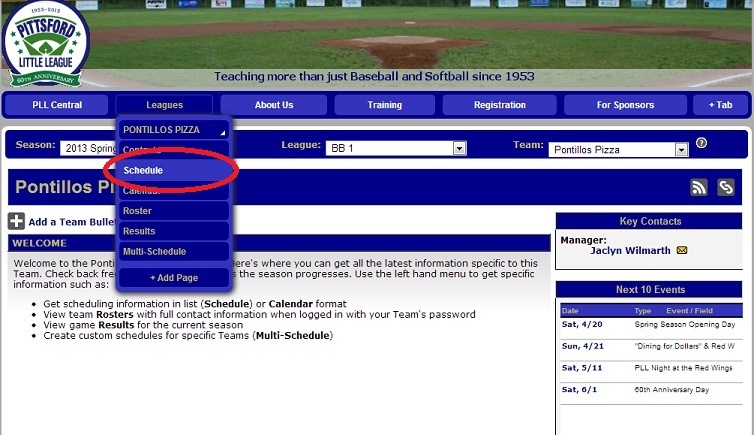 Only some leagues allow managers to schedule practices online. Please see How to Schedule a Practice. The practice you create will appear on your team's schedule, along with your official games, etc. Note: The Master Schedule will display ALL teams' practices and games. There are nine rules that apply to resuming a Majors game and having a subsequent game on the same day. Do you know them all? Written instructions can be found here.